Today’s supper is THAI PIZZA (pg. 145)–a favorite of this family. The same friend (Rene) that gave me the recipe for the Poppy Seed Dressing introduced us to Thai Pizza. I own the California Pizza Kitchen Cookbook, and have my own variation of their recipe. I was interested in trying a pizza that drizzled the peanut sauce on top, as I spread it on the pizza like a marinara sauce. 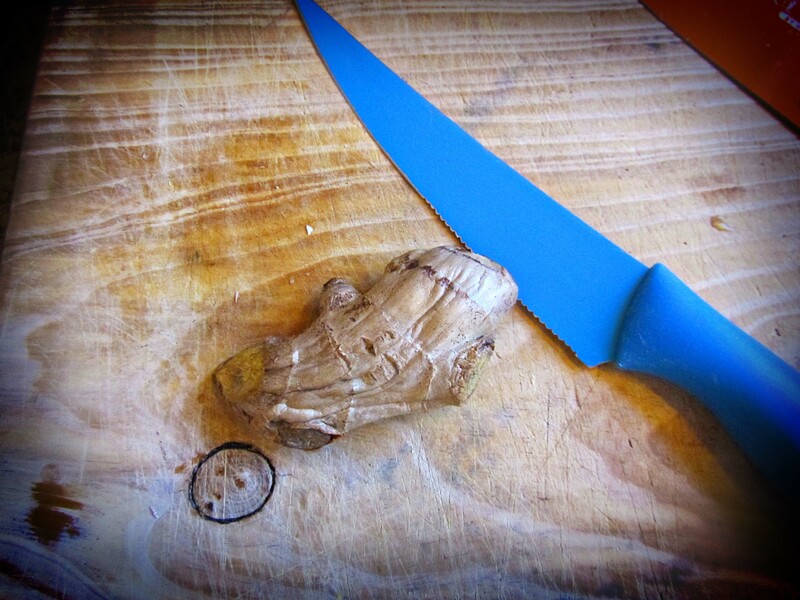 Let’s start by dicing up some fresh ginger. But before we do–a short cooking class. Ginger 101 coming up. Ginger not only has an edible rhizome, but it the south, it is used as a landscaping plant. I remember shopping at Publix (a southern grocery store) and seeing 50 feet of blooming ginger running along the outside wall. (photo from here.) This is variegated ginger, and not the exact ginger inside the grocery store, but usable. And here is a good site if you would like to grow your own ginger. Ginger can also be dried. We buy it in the spice aisle in the powered form at Thanksgiving time, but it can also be dried in slices. I sometimes buy ginger like this as I don’t always have “fresh” ginger in my crisper. Ginger is used in both savory and sweet dishes and in both eastern and western cuisines. 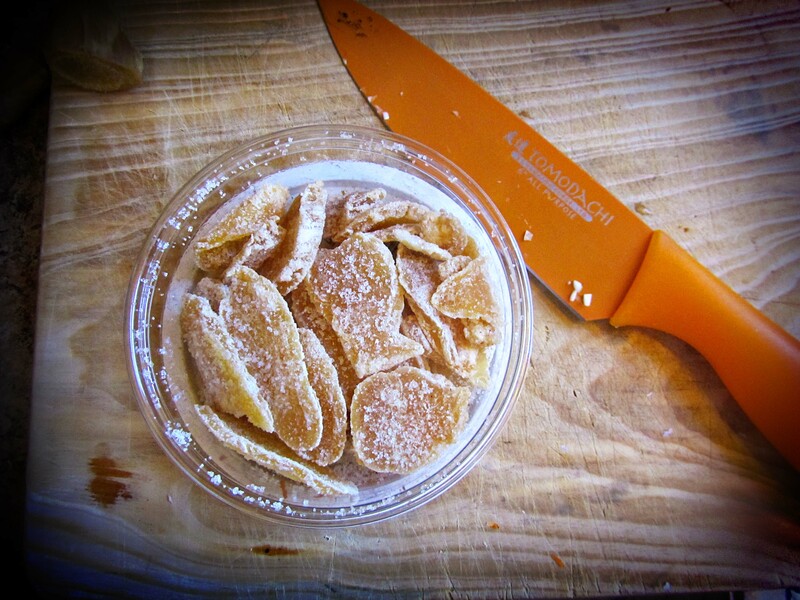 And here are a few more Nuggets of Knowledge about ginger. Dissolve the sugar and ginger in the vinegar. But back to Thai pizza. Julienne some carrots. Chop some peanuts. Mince some cilantro. Slice up two grilled chicken breasts. And grate some mozzarella (or just open the bag.) 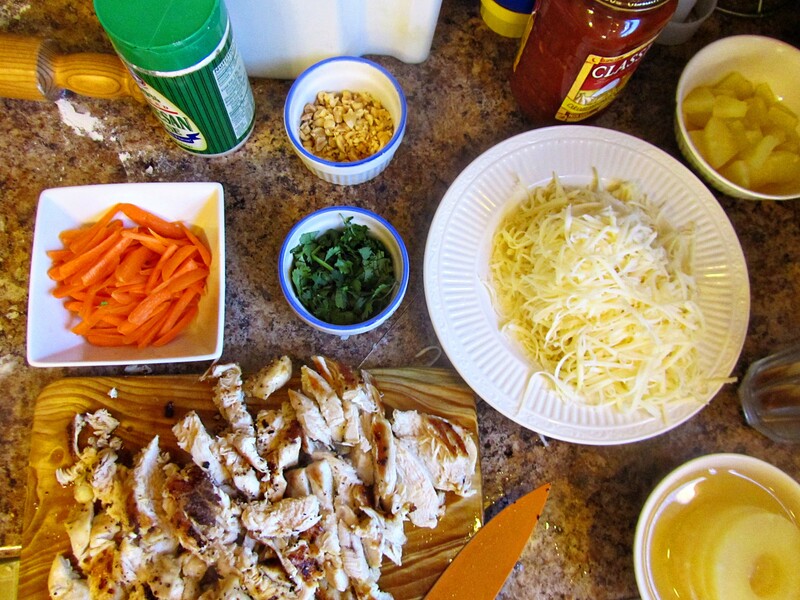 This is cooking mise en place–or with everything in its place. I have all the stations ready for assembling the pizza. 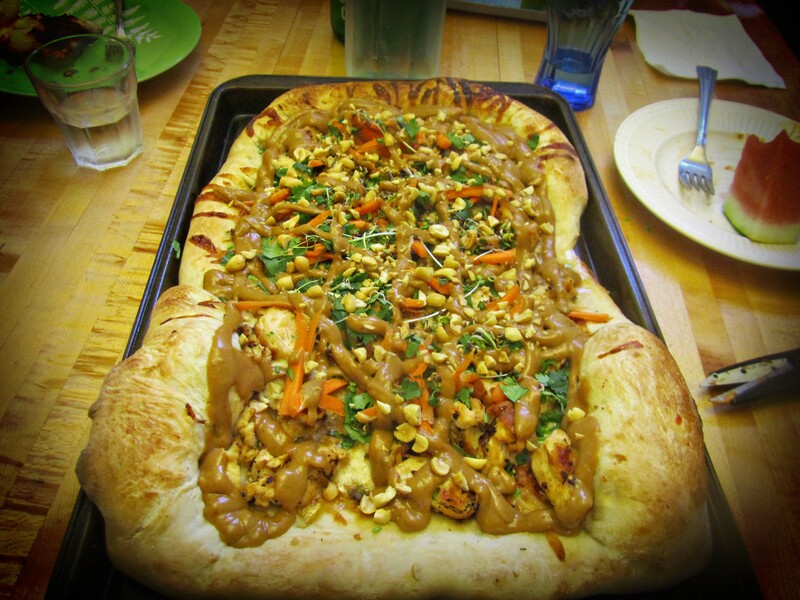 I just need the peanut sauce to drizzle over the top. 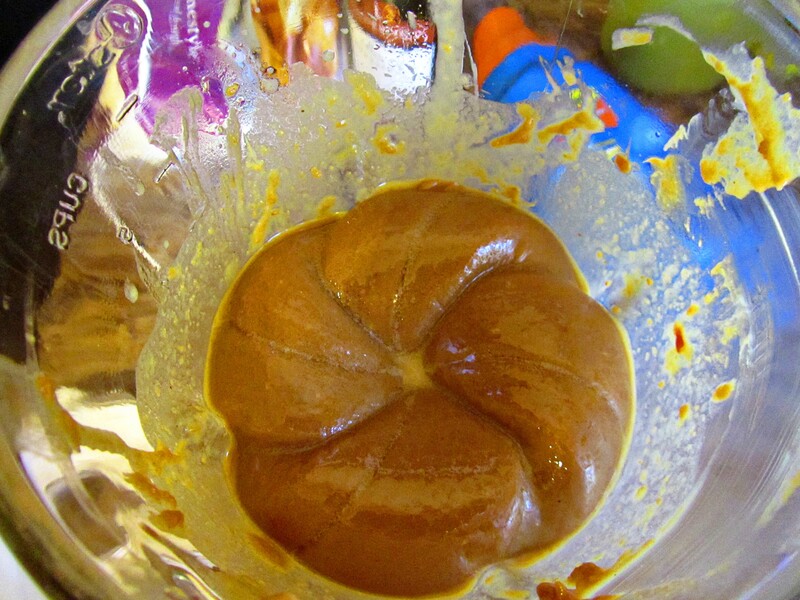 I used the blender for the peanut sauce, but you can also use a food processor. 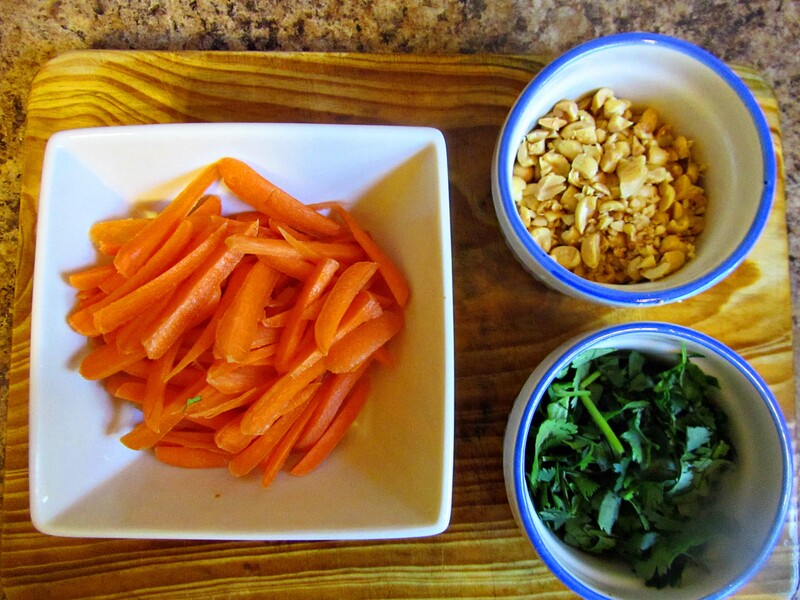 The peanut sauce requires, garlic, fresh ginger, soy sauce, fish sauce, peanut butter, and Thai sweet chili sauce. The fish sauce smells like the name, but surprisingly it makes the sauce taste great. Remember, the best Caesar Salad dressings have anchovy paste in them. 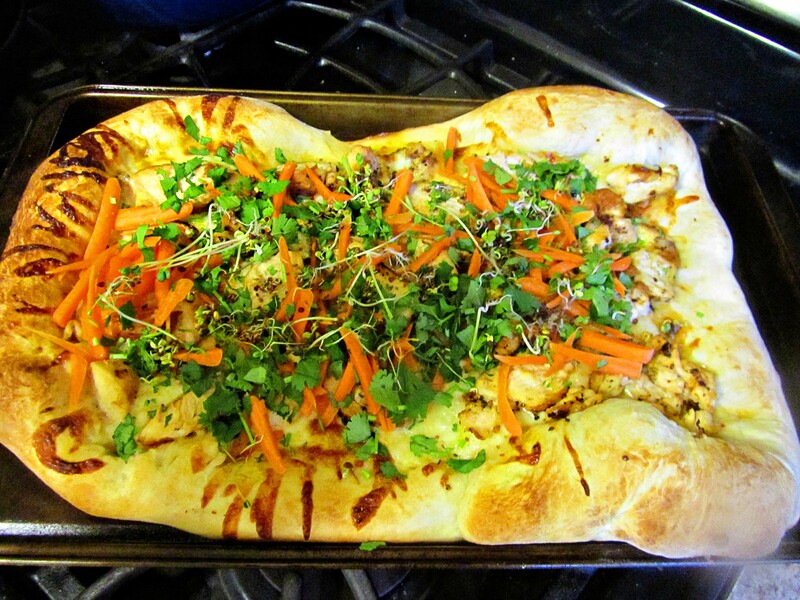 The pizza is baked without the carrots and cilantro. They are added just after baking. 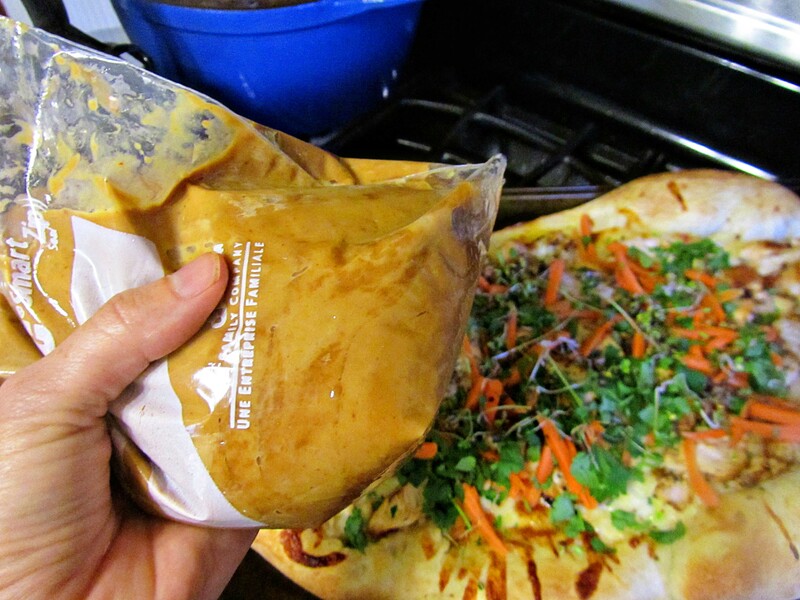 Then the peanut sauce is drizzled on. I used a zip loc bag and snipped the end off as I didn’t have any empty squeeze bottles laying around. It worked fine. The extra peanut sauce I used as dipping sauce for Chicken Satay. 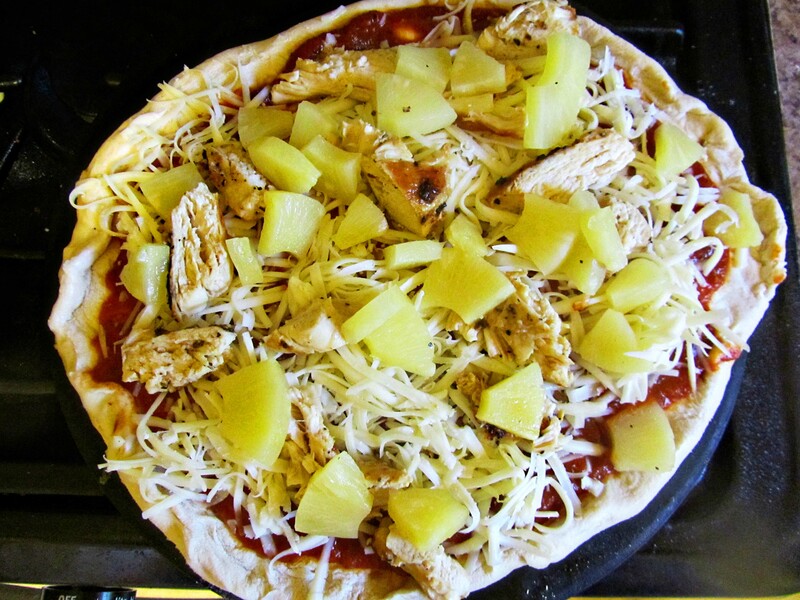 I also made a Hawaiian pizza because A) The kiddos love it. B) We need more than one pizza to feed this family. C) One kiddo doesn’t eat Thai pizza. D) Left over pizza is a good snack. 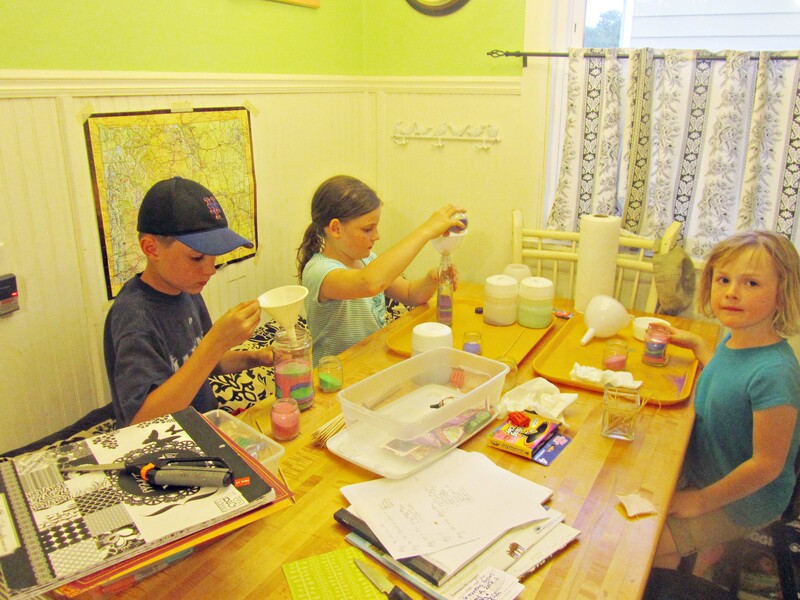 And after supper and clean-up, we made samples of all the crafts we planned on using at our Backyard VBS and at the Michigan Family Camp. 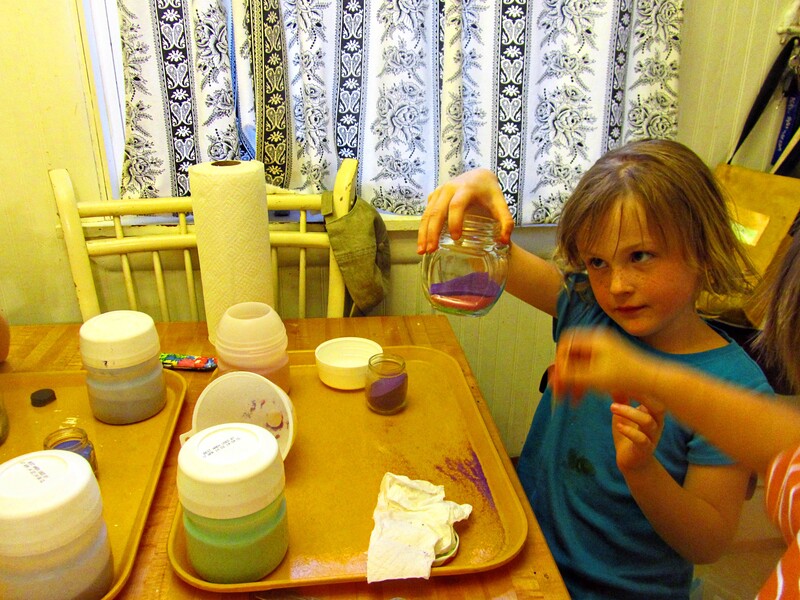 The sand art in a bottle was loved by all. I saved bottles for an entire year, and I am very thankful for the three extra shelves in my pantry now that both VBS and Camp is over. The funnels came 3-4-A-$ (three for a dollar) at Dollar Tree, the bottles were “free”, and the sand was about $8/ 10 lb. bag at my local Hardware store. The colored sand was Crayola brand. While we were making the samples this odd procession went down the street. It was three Dumpster Divers checking out our street for Finds. The lady/wife? 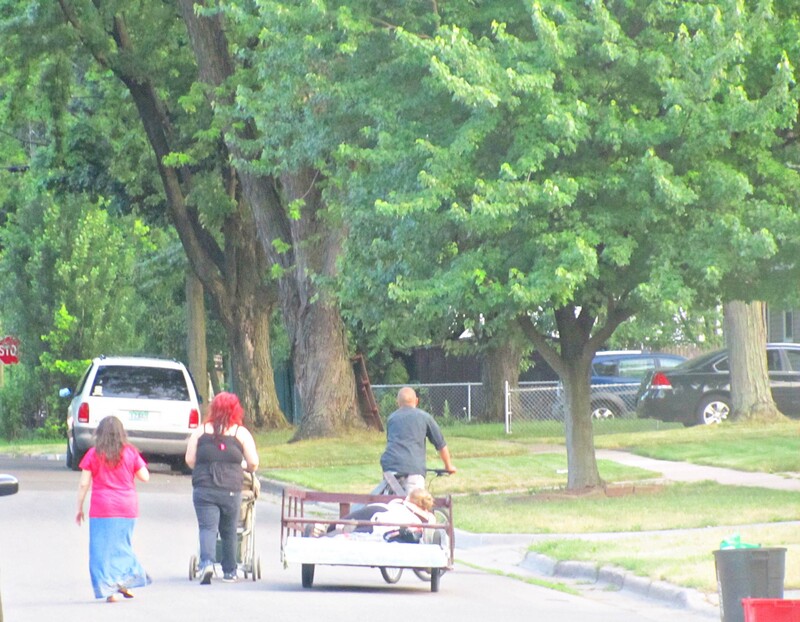 in the trailer was obese and was being pulled on a trailer by a bike. That was our THAI PIZZA day. And since we are back from a tangent, let me add that I am currently reading Anna and the King of Siam by Margaret Landon first published in 1943. This book inspired the musical “The King and I.” I will write-up a proper book review in another post, but typing about Thai pizza and reading a “Thai” book was too much to not comment on. I think I left you hanging on. Here is a better sentence to close with. P.S. Were “the bottles laying around?” or were “the bottles lying around.” I couldn’t decide. Are the bottles being personified and therefore they are “lying” (even though they were stored upright) Or are the bottles being place or “laid” on a shelf. Tell me! This entry was posted in Recipes and tagged Anna and the King of Siam, cooking pioneer wom, cooking ree drummond's cookbook, fish sauce, ginger 101, The King and I. Bookmark the permalink. We have to do multiple pizzas in this house too – one vegetarian, one with only three ingredients (for the fussy eater; no green bits) and one full on, no holds barred, everything on it (for me and the adventurous eater). And I’m envious, why can’t I get photos of people dragging obese people down the street where I live? These are the moments that blogging was made for! It was the oddest thing! I had to run back into the house to get my camera, so the shot is a bit far away. Because Steve is sitting right here and I can ask him, (for he’s smart and I’m not), he says it’s “lying” around because the bottles weren’t laying anything around. They were simply resting. So now we know. By the way, I want my kindergartener enrolled in your school! Thanks! Steve is smart. But you are too.